Need glasses? See an optician! 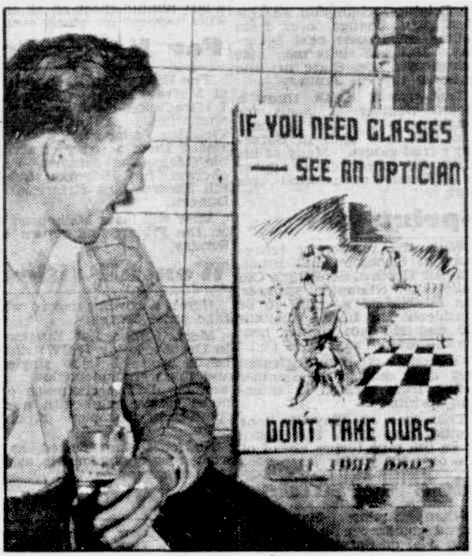 A hint on stolen beer glasses is given by this amusing poster in the Royal Exhibition Hotel, Sydney. Hotels there have had hundreds of glasses stolen in recent months. – News (Adelaide) Wednesday April 6 1949. During the 1940s, publicans were experiencing unprecedented theft of beer glasses from their pubs. One newspaper reported more than 7,00,000 glasses disappeared from Sydney’s 600 metropolitan hotels in 1944, “In an amazing wave of petty thieving”. Hotels lost an average of 60 glasses a week! The licensee of a Melbourne hotel said in 1945 petty thefts, mostly of 7oz. glasses, had cost him £470 over the last two years.